The USS Arizona was one of several United States battle ships that were sunk by the Japanese Imperial Navy during its surprise historic attack on Pearl Harbour, Oahu, on December 7, 1941, causing the US to enter into World War II. The Arizona sank in about nine minutes, along with 1,177 sailors and marines who were on board. Visitors are carried by Navy shuttle boats to the unusual memorial centre, which has been constructed over the sunken hull that lies six feet (2m) below. The names of the dead are inscribed in stone inside the memorial. Visitors are shown a documentary film, and can view artefacts and exhibits explaining the tragedy. The memorial is open daily, but there is always a large queue for the free tickets, which are issued on a first-come-first-served basis, so be prepared to wait. Bookings are not taken. Opening times: Daily 7:30am-5pm. 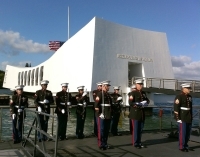 Interpretive programs, including a documentary film about the attack on Pearl Harbour, and the boat trip to the USS Arizona Memorial, begin at 8am (7:45am in summer). The last program each day begins at 3pm.